For the one in five Americans with a disabling or chronic condition (U.S. Census), there’s a point when the insurance-covered rehabilitation taps out—despite the need for ongoing restorative physical activity in a safe environment. Northridge, California based entrepreneur Aaron Baker is picking up the slack with his low-cost rehabilitative fitness center, called the Center for Restorative Exercise (C.O.R.E. ), that he hopes to expand in 2016. C.O.R.E. was inspired by the success story of Aaron Baker, a professional motocross racer who became a quadriplegic after a training accident in 1999. Aaron had been given a grim prognosis—a one-in-a-million chance of even feeding himself again—but deep inside he knew things could turn out different. His progression has been nothing shy of a miracle, learning to stand, walk with crutches, then ride a tricycle and even pedal it across the United States. But what now feels like a foregone conclusion wasn’t always so. For Baker, one of the largest obstacles to his recovery was lack of access to proper resources for improved health and physical fitness. After one year in therapy, Aaron’s time in rehab was cut off. The insurance caps reached their maximum and he was forced out of the only available programs where he could make progress. He was still a long way from standing on his own but he was showing promising signs of movement in all four limbs. Baker’s own experience in defying the odds inspired him, his mother Laquita Dian, and Isaacs to create a place where other special-need individuals could receive support and have the same opportunity for recovery as he did. Clients at C.O.R.E. include those suffering from a spinal cord injury, muscular dystrophy, diabetes, hypertension, osteoporosis, and other disabling conditions. C.O.R.E. strives to fill this health and wellness gap between physical therapy and independent fitness. A state-of-the-art, niche fitness facility focused on rehabilitation, C.O.R.E. is primed to change the way people view the possibilities for recovery from a disability or chronic illness. It helps clients at all stages of recovery and ability accomplish their goals by providing affordable and personalized evaluations, education, and progressive treatment plans. But perhaps most importantly the gym is affordable meeting the fixed income needs of many who need this service. The story of Baker and C.O.R.E. is the subject of a new documentary titled Coming to My Senses, the film will document Baker’s 15-year struggle to reclaim movement, share the effects of sudden trauma on his family, and introduce C.O.R.E.’s new paradigm for rehabilitation in the spinal cord injury community. 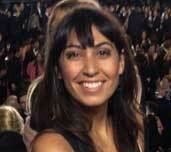 Nadia is President at Encompass Films.